Nick and Jo were married at the incredible Town Hall Hotel in Bethnal Green in the vibrant East End of London, which was the perfect backdrop for their wonderful art deco inspired wedding. A venue with this much personality doesn’t require a lot of additional styling so all the decor was kept subtle with a nod to the exquisite features of the fascinating venue. The wonderful Sara Lyndsey captured the romance and intimacy of the celebration, resulting in seriously stunning images. Our art deco inspired ‘Gatsby’ wedding stationery range complimented the venue and gave the guests a little idea of what the day might entail when the save the dates arrived through their letter boxes. The wonderful Shima Hossaini did Jo’s hair and make up and made her look breathtaking. Especially with the incredible crystal headpiece that Jo wore in her hair and beautiful dress purchased from the Stamford Bridal Rooms boutique. The invitation were screen printed in gold ink on luxury 700gsm GFSmith black card and included an invitation, RSVP card and info card all held together with a belly band and gold foil sticker. All these elements were then slotted into a luxury gold lined black envelope with a label sticker wrapping around the side. The flowers were kept simple in beautiful ivory with a subtle hint of green to add a pop of colour. The marriage ceremony took place in the spectacular Council Chamber with drinks and canapes being held in the adjoining oak paneled room complete with wall mounted rug animal (you have to see it to believe it). 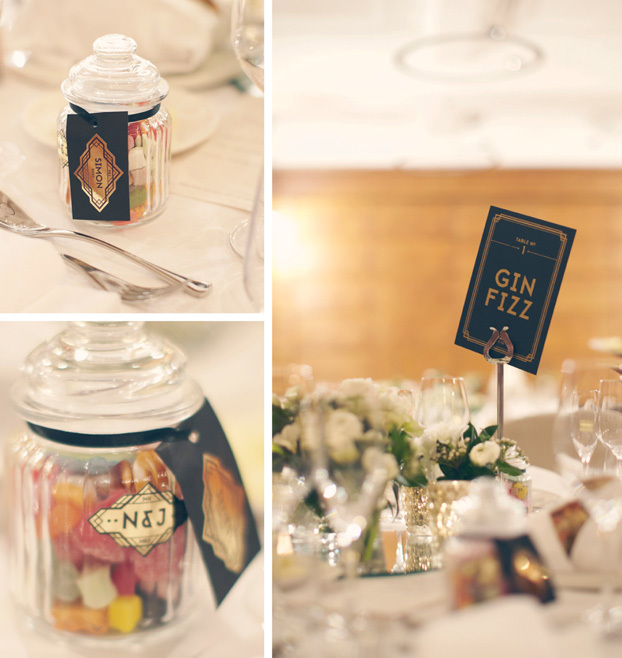 All items on the day included table names, place cards, favours and the table plan were created by Basil & Ford using the same ‘Gatsby’ theme. The table plan was printed on thick ply board and then individual gold foil stickers featuring each guests name were stuck on black tags and tied around small jars filled with sweets. More photographs of this stunning wedding can be seen on the photographers webiste here.